A Church of England vicar who shared an article on Facebook which blamed Israel for the 9/11 terror attacks has been banned from social media after being accused of anti-Semitism. 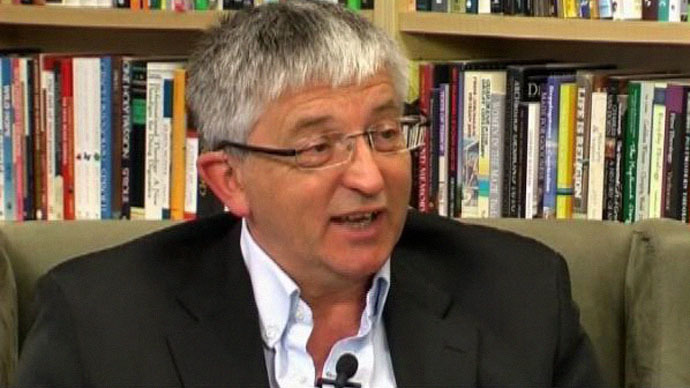 Reverend Dr Stephen Sizer has been ordered by the church not to write, blog, tweet, email, preach or teach about the situation in the Middle East. He has also agreed to stop using social media entirely, including his blog, for six months. There is no guarantee he will be allowed to use social media after this period. Sizer, who is vicar of a parish in Surrey, has agreed to offer his resignation to the Diocese of Guildford in the event he breaches the conditions of his ban. The ruling by the Bishop of Guildford, the right Reverend Andrew Watson, follows an incident where Sizer posted a link to an article titled “9/11 – Israel did it” on his Facebook page shortly after Memorial Holocaust Day in January. When contacted by the Jewish News, Sizer appeared to defend the post, asking them to provide evidence Israel was not involved in 9/11. “I would welcome articles you can recommend refuting the allegations,” he reportedly told the newspaper. The Board of Deputies of British Jews complained to the Church of England about the 9/11 Facebook post, saying it promoted an article which was “unquestionably anti-Semitic.” Sizer removed the link soon after. Sizer, who is an outspoken advocate of the Palestinian cause, has a history of disputes with Jewish community leaders over his vocal opinions. At a news conference on Monday, Watson apologized on behalf of the church for any offense Sizer had caused to the Jewish community. “I do not believe that his motives are anti-Semitic; but I have concluded that, at the very least, he has demonstrated appallingly poor judgment in the material he has chosen to disseminate, particularly via social media, some of which is clearly anti-Semitic,” the bishop said. Referring to guidelines by the Council of Christians and Jews, he suggested that criticism of Israel is not itself anti-Semitic, but that legitimate criticism must not be used as a “cloak” for anti-Semitism. The bishop said he welcomed Sizer’s apology and recognition of the hurt he caused, in addition to his retraction of the “ridiculous suggestion” that Israel was behind 9/11. “Having consulted closely with my colleagues here in the diocese, though, it is my view that Stephen’s strong but increasingly undisciplined commitment to an anti-Zionist agenda has become a liability to his own ministry and that of the wider church,” Watson said. The Board of Deputies welcomed the decision, expressing gratitude to the Church of England for sharing their concern. “The Board together with the Diocese of Guildford and the Church of England strongly believe that good community relations are based on mutual respect and trust, which we now hope can be restored after this very unhappy episode,” Board of Deputies vice president Jonathan Arkush said. In a letter to Watson, Sizer issued his own apology for the 9/11 Facebook posting. “As a minister of the gospel it is not my role to create controversy but to seek to maintain unity between the faith communities,” he said.